Strong anvil model for hard wood, plastic profiles or hoses. Easy-to-replace, non-stick coated blade. 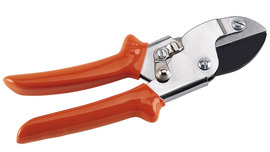 Corrosion-resistant pruner body. Pull-to-cut method saves energy.